The measure requires doctors to notify patients that Lyme tests can be inaccurate. There are speakers on both sides of the issue. However, about 9 minutes in, there are especially poignant remarks from Delegate James Edmunds, who states that he believes his father died from undiagnosed Lyme disease, after a having a Lyme test that was supposedly negative. 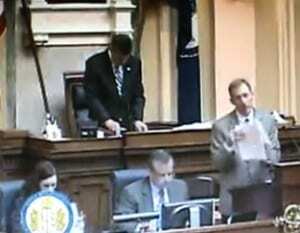 In the end, the House of Delegates passed the measure, which goes on to the governor for signing. Next Post » NEWS: Newspaper calls government response to Lyme "callous and lacking"
The problem is, Dr.’s testing for Lyme, need to use the correct LABS, that have the most accurate test. Lyme bacteria can hide INSIDE red blood cells and can go undetected. You’re a lucky patient if a lyme spirochete happens to ends up n the vial you draw. We want State Reps to LEARN why the test is so faulty, ignore the “language”, just learn WHY the test is faulty. It’s so simple, require the Dr.’s to use I-Genex or Fry Labs, which are the ONLY testing facilities that Lyme Literate Medical Dr.’s (LLMD) use! The cost is $260 for the Basic Full Western Blot Test, it’s ALL we need. They allow the blood culture to grow longer and do specialized things to the blood to see INSIDE the blood cell. When a patient is so sick, they will gladly pay the $260 out of pocket, most of us have to BEG our Dr.’s to sign the paperwork. Please watch video’s online to better understand the lyme spirochete inside a red blood cell, just google that on YouTube, please!! We need change immediately. I pray you guys will move quickly, so this bill will wake-up our Reps ASAP. We have thousands of sufferers here!! I’ve had to go out of state for the past 5 years to get a Dr. that knew what he was doing.. Please PASS this bill and then work on the language of what it means later. Time is running out for us!